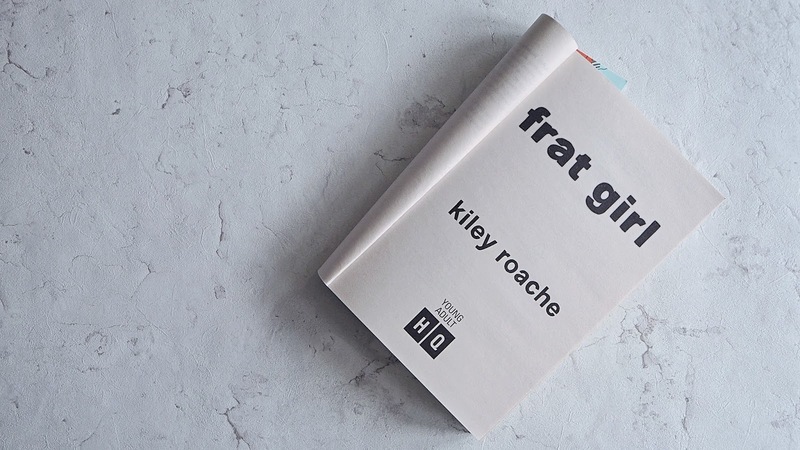 "Frat Girl" is a debut novel from Kiley Roache, an 18 year old blogger and editor with the Huffington Post. Kiley has also been a reporter for the Chicago Tribune while she was a high school student, and also wrote for The Doings, a Sun Times Media Paper. She also attends Stanford University. With a list of achievements like this, it makes me feel like I haven't done very much with my life! 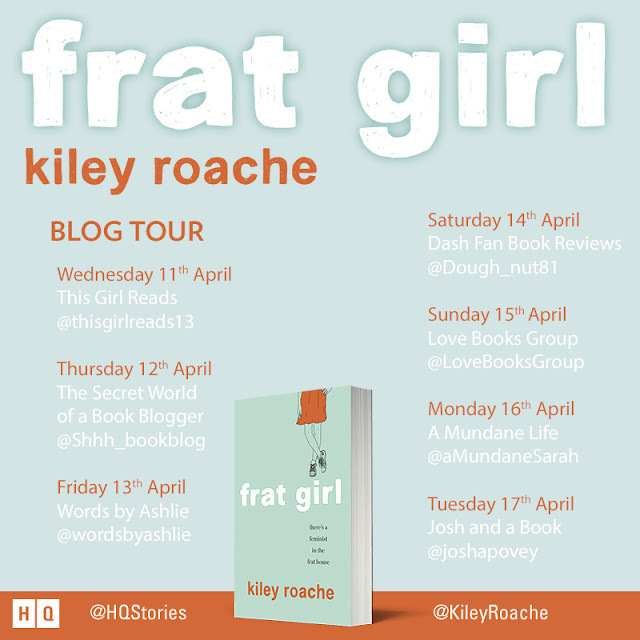 After hearing all of Roache's successes, I had high hopes for her debut novel "Frat Girl". This would be my first contemporary novel with feminism as it's main theme. I was a little skeptical before reading the book, mostly due to the fact that I don't know much about Feminism. I only know what I see in the media, and on twitter, and although I do believe in lots of points within Feminism, I know that I only know surface details about the history and don't have much involvement with campaigning. As it turns out, I was right about not knowing much about feminism, and this book definitely taught me a thing or two. I also got to experience the Frat and Sorority system that is present in American Universities. This review is part of the "Frat Girl" blog tour. I was sent a paperback copy of the book (by the publisher) in exchange for this post. All opinions are my own, and do not reflect those of the publisher, or anyone who works within the publishing house. For Cassandra Davis, the F-word is fraternity – specifically Delta Tau Chi. Accused of sexist behaviour, they have one year to clean up their act. With one shot at a scholarship to attend the university of her dreams, Cassie pitches a research project – to pledge Delta Tau Chi and provide proof of their misogynistic behaviour. After all, they’re frat boys. Exposing them should be a piece of cake. But the boys of Delta Tau Chi are nothing like she expected and soon, with her heart and future tangled in the web of her own making, Cassie realises that the F-word might not be as simple as she thought after all. After reading the blurb for this book, I thought that it would be something that I would enjoy reading, and a nice quick read too. I usually find that YA Contemporary books are a nice easy read with relatable characters. As contemporary novels are set in our own world, it is easier to relate to the settings and surroundings of the characters, as they are placed in the "Real World". I have always been a bit fascinated with the American University system, as we don't have Frats and Sororities over here in the UK. I always find myself watching, and enjoying films that are based around universities and the greek system. Films like "Legally Blonde" and "The House Bunny" have introduced me to the Greek system, but they have all seemed a bit stereotypical and focusing on how the girls need to be pretty to be noticed. In lots of films with sororities, the focus is on make overs for girls, and having to look pretty and feminine. Even in Legally Blonde, we start off with the girls being shown as over feminine and looks being more important than brains. As the film progresses we see "duller" girls not getting the same amount of opportunities as those that look nice, and this is often mirrored in real life. The concept of a girl going into the Frat house to prove that there is misogynistic behaviour is a great premise, but for me I was left a little bit disappointed. Frat Girl is written extremely well, and there was plenty of information about feminism throughout the novel. I did feel that sometimes it went into a bit too much detail and I found myself getting a little bit bored, and feeling like I was being preached to. However, it was refreshing to see that someone was standing up for themselves and making a stand about something they strongly believed in. The main thing that disappointed me, and something that I do really dislike in both films and novels, is the feeling of insta-love or the hint of romance straight away. At the beginning of the novel, Cassie meets a boy on the way to her first visit to the Frat house. She is immediately attracted to him, and this is fine, but the book instantly started talking about this attraction and I instantly began rolling my eyes. It reminded me of the film "Never Been Kissed" where she goes undercover at a high school and has to lie to everyone about who she really is, and how she is studying the high school experience. I would have liked it to focus more on the Frat house first, with a guy coming along a bit later. It instantly felt like the romance was the main focus, as opposed to the book being about Cassie going undercover. As the novel progressed, I did grow to like some of the other characters in the book, but romance right at the beginning of a novel just isn't for me. Something that I did like about the start of the book, was when Cassie met her room mate and found out that she was on the opposite side of the spectrum when it came to feminism. She thought that being a feminist was negative, and didn't want to be seen as having anything to do with it. She wanted Cassie to steer clear of showing that she was a feminist, and this mirrors a lot of opinions that are around at the moment, and have been around for a very long time. Many women are still afraid to show how they feel, or are stuck in the stereotypical view of a woman. I am glad that I gave this book a go, and I do see this working well as a film or a short series. I can see how people may relate to seeing a physical representation of the themes in the book. As someone who has not been to an American University, and someone who is now past that stage of life, I think that lots of it was lost on me. I can see the 18-25 age range really enjoying this novel. THIS POST IS PART OF THE "FRAT GIRL" BLOG TOUR, ARRANGED BY HQ STORIES. THE BOOK IN THIS POST WAS SENT TO ME BY HQ STORIES IN EXCHANGE FOR AN HONEST REVIEW THIS WEBSITE USES AFFILIATE LINKS. FOR MORE INFORMATION, PLEASE READ MY DISCLOSURE POLICY.